Leopard and Lipstick: The Hollywood Costume Exhibition: Please can I have replicas? 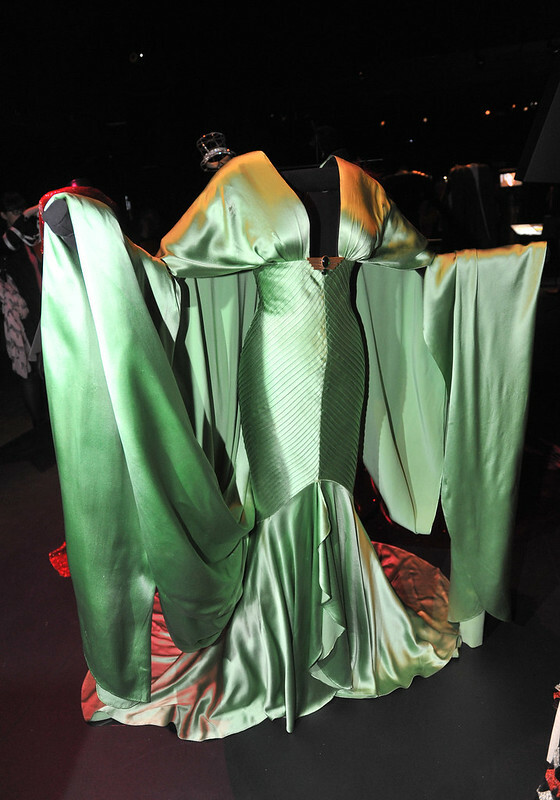 The Hollywood Costume Exhibition: Please can I have replicas? Oh hello there you little petals, how the devil are you? On Saturday me and Ben went to the Hollywood Costume Exhibition at the V&A it was the last weekend of it and I swore I would see it as I missed the Wedding Exhibition last time round. I am so glad we went, we got the train in the early hours of Saturday morning, I can sleep on anything so I promptly nodded off until I got rudely jabbed in the side by my beloved. Before we knew it we were queuing in the underground entrance of the V&A once the doors opened people almost sprinted to the exhibit, I totally spotted hip and happenin designer Henry Holland. 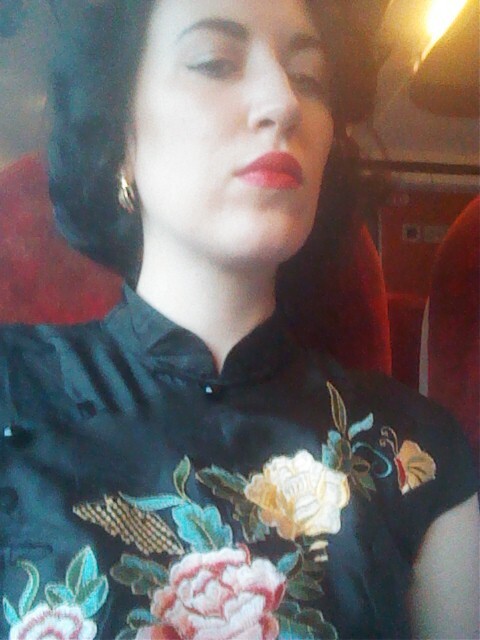 Snippet of my ensemble, need to do a post on my favourite Cheongsam! Any who the costumes were divine, I still cannot get over how tiny most actors are. They seem larger than life on screen right? but most of them are average height or smaller. 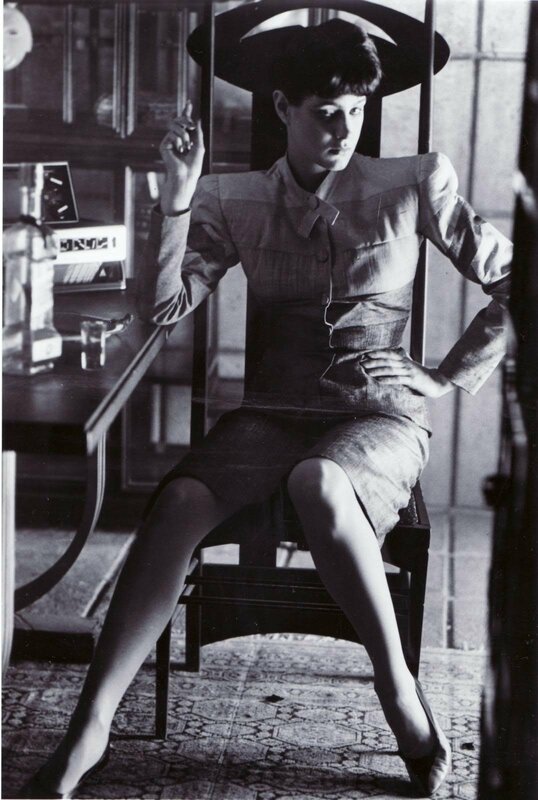 The costume that really got me was the waitress dress that Joan Crawford wore in Mildred Pierce, I welled up at the sight of it, it's one of my favourite films and one of the first noirs I discovered whilst studying film that got me hooked on the genre. Vivien Leigh's infamous curtain gown from Gone With the Wind- I constantly tease my mum that she should tear down her raw silk curtains to make me such an ensemble, she has not taken me up on this. You look so elegant in the vintage/antique cheongsam. I’d love to see your dress in its entirety. I’ll be wearing some of my grandma’s cheongsams for the Chinese New Year & hope to post some photos on my blog. What a treat to see all of those gowns in person! I am really not very knowledgeable about film noir; I’ll have watch Mildred Pierce asap. Ohhh, what a gorgeous little sneak peak at your sublime outfit. I've been feeling Asian inspired vintage wear so very much this year (more than ever before), and can't wait to see more of this beautiful dress. I went last weekend (when the courtyard was full of beautiful snow...) and I really enjoyed it. I wasn't anticipating that I would enjoy it as much as I did - if I didn't have V&A membership, I probably would have passed it up. But I found it fascinating. What I particularly loved was seeing interpretations of the same historical periods in different eras (for example, the Cleopatra outfits you mentioned - incidentally, that mint green dress was one of my highlights too) - I found that really interesting. You sometimes hear people complain about the inaccuracies of period costume in film but I find it a fascinating insight to see what is picked up and how things are subtly altered for audiences in different periods. Overall, though, I just thought it was a wonderful exhibition - really comprehensive and interesting. Glad you made it down to see it! And how can you tease us with just a peek at that outfit?! You look very Liz Taylor in that shot! Thank you, that's a wonderful thing for you to say! I was so bummed to miss that exhibit when we were in London. We just ran out of time. I saw a Hollywood Fashion exhibit here in the States a few years back that had a few of the same items (I remember the Queen Christina gown and Claudette Colbert's Cleopatra). I was surprised at how tiny everyone was (men, too!). Obviously, being movie stars they were thin, but they were so short!